I could have been writing for a real agency, getting paid 10 times more, and building my presence on the web. But instead the author byline link to that article went to someone else’s site. My articles were building her authority. They were driving traffic to her website. They were establishing her brand. I realized I’d been pimped out by a content mill disguised as an ad agency. And it hit me hard. But, now that I know “agency” isn’t synonymous with “integrity,” I can sniff out a veiled content mill like a trained hound. You can too. 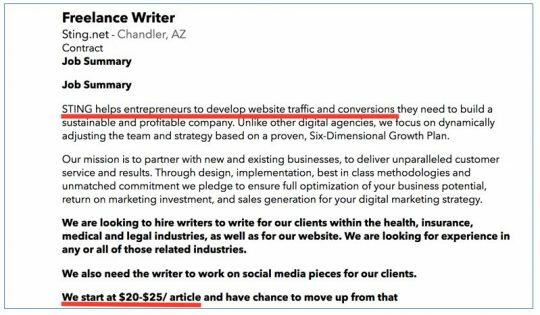 An agency that offers $15 for an 800-word blog post is preying on writers who don’t realize their value. “Never undervalue the service you provide,” says Caryn Starr-Gates, a copywriter whose own business, StarrGates Business Communications, was built by subcontracting work from reputable agencies. You can expect a decent agency to pay about 20 percent less than if you work directly with a client, she says. For example, freelancer Sarah Rickerd makes $75 per blog post writing for agencies. A third-rate agency won’t expect you to interview sources or include quotes. Instead, they’ll want you to find a few published articles on a specific topic, then meld them into one piece. This is called article spinning. Article spinning is legal—if you don’t plagiarize—but it’s a recipe for low-quality work that’s bad for the agency’s clients and your portfolio. It’s the kind of writing assignments content mills are notorious for. The point of spun content is to get a lot written—fast. “If they’re relying on you to push out a whole bunch of product, they’re just a churn and burn content mill,” says Starr-Gates. A reputable agency will always prefer quality over quantity. An unscrupulous agency will give you vague information about the clients you’re writing for. For instance, I was rarely given the names of client companies, only their industry type. I didn’t know their brand voice or their target audience. I was writing blind. A good agency will expect you to handle the client process and trust you to represent the company. Or at least have an account manager that works as your go-between on projects, says to Starr-Gates. If I hadn’t decided to Google the first paragraph of my article, I’d have never known who was using it, or how. If you’re writing for a pimped-out content mill, someone else will own and benefit from your finished work. Ghostwriting gigs are great, but legit ghostwriting gigs pay pro rates. Not the $20 per assignment, less PayPal fees, I was earning. Know your clients, and you’ll know where your works ends up. And if you negotiate your contract well, you’ll have permission to link to and share your work. The worst agency offenders treat their freelance writers like employees, try to control every move you make, and have unreasonable expectations for availability and turn-around time on assignments. FYI…you’re not an employee. You’re a business owner who provides valuable writing services. “You should partner with people who want your services, respect the value you bring, and are willing to pay for it,” says Starr-Gates. If you want to write for agencies, that’s fine. Many pay competitive rates, treat their freelancers well, and have ongoing content needs. But you’ll need to do your homework before you sign a contract. That agency might actually be a pimped-out content mill luring writers into doing cheap tricks. Have you had experience writing for agencies? Let’s discuss on Facebook and LinkedIn. Holly Hughes-Barnes help businesses and publications speak to other women like her. She specializes in writing articles, blog posts, and case studies that build authority and rapport.